Why does spit stop your mask from fogging up? Why does nitrox allow longer diving times? What is oxygen toxicity? Find answers to these and other scuba diving related questions on this page. You can also ask us questions you’ve always wanted answered and we’ll post the reply on this page. Why do some jellyfish glow? What is the difference between Decompression Illness and Decompression Sickness? 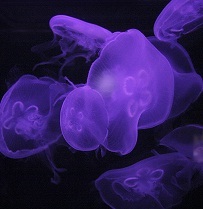 Some jellyfish, and in fact a large number of other fish and creatures in the ocean, glow in the dark. This is a process called bioluminescence. It is estimated that about 50% of jellyfish are bioluminescent. Animals use chemistry to make light. Bioluminescence comes from energy released from a chemical reaction, unlike in other light sources, where the light comes from heat. The color of the light depends on the structures of the chemicals. Some animals such as the Humboldt Squid can even glow in multiple colours, depending on their mood! There are several theories as to why bioluminescence developed. As it is useless unless seen by other creatures, it is thought that animals use bioluminescence to interact with other animals, for example to attract prey, to defend themselves against predators, or simply for communication. In recreational diving, it is nearly impossible to reach the threshold where oxygen toxicity becomes a problem, however the increased use of enriched air and the increasing popularity of technical diving, where high oxygen mixes are used, have made oxygen poisoning an issue. Oxygen toxicity can affect your respiratory system and your nervous system, depending on the lenght and pressure you were exposed to breathing high oxygen mixes. The general thinking is that oxygen toxicity occurs because oxygen, which is carried through the blood stream, interacts with chemicals under certain pressures, creating free radicals. These, in turn, react in damaging ways with the body’s structure. If you are involved in diving where oxygen toxicity can become a problem, be careful to always plan your dives within safe oxygen pressure limits. Although you sometimes hear the two used interchangeably, decompression sickness and decompression illness mean two different things. Decompression sickness refers to the condition caused by inert nitrogen bubbles or other gas coming out of solution and forming bubbles within the body. Decompression illness, on the other hand, is a term that refers to both decompression sickness and other conditions caused by bubbles within the body, such as lung over-expansion injuries. As both require similar first aid, decompression illness is used to describe both conditions.